Welcome to Week 2 series: Analytics Tip Of The Week. In your Google Analytics account, click the menu item on the left side for Audience, then Geo, then Location. Google provides you with a nice little summary of your website visitors known country. If you want to get more detailed information, you can click on a country name, which then breaks the chart down to Regions (often State or Province), such as in the image below from clicking on “Canada”. If you want, you can even get down to the city. Just the number of users alone can be useful – if you are targeting a given area with advertising, this will give you an indication if you are successful or not. 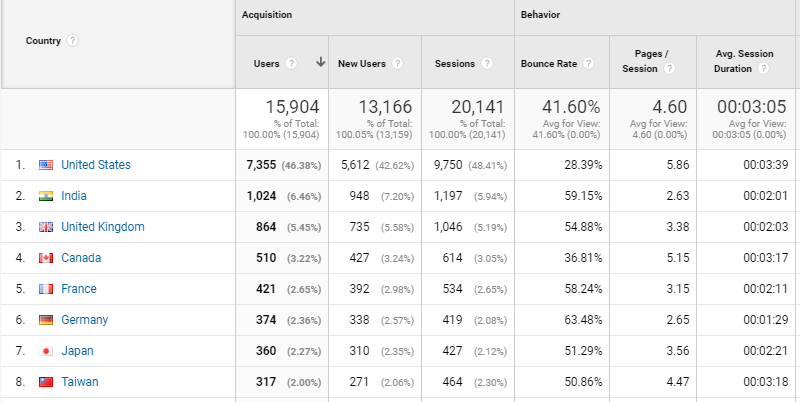 But beyond just the user numbers, these charts provide a lot more information about user behaviour on the site. Looking at the numbers in the first image, for example, we can pull out some quick results. For example, visitors from the United States visit 5.86 pages per session, while those from the United Kingdom visit an average of 3.38 pages per session. Why the difference? That depends on your website. Perhaps you have content that is more targeted towards the US rather than the UK. In which case, that is what you would expect. But these are both English-speaking countries, so if you would expect your content to be equally of interest to both places, and you are seeing differences like this, what is the reason? Maybe you are making assumptions about your content that aren’t true? Maybe there is a technical reason? Whatever it is, you now know something new about your website, and you can work on it to improve performance.